Even though I’m a longtime fan of Hong Kong movie star Andy Lau, I didn’t know that he has made more than 140 films. Busy, busy man! The versatile actor with the killer cheekbones is equally at home as a handsome, well-dressed guy in frothy rom-coms, as a gangster or cop in crime stories, or as a swashbucking hero in period costume epics. In Lost and Love (Shi Gu), Lau’s character, Lei Zekuan, is not glamourous, but he is heroic all the same, in his own quiet way. For 15 years, farmer Lei his been searching for his son, Lei Da, who was abducted while Lei and his wife were working in their orchard. The boy was under his grandmother’s care; someone ran off with him when her back was turned for a moment. While Lau’s character is sad and subdued, but he’s stubborn, too, determined to carry on and never give up. And he’s not so absorbed in his own quest that he can’t sympathize with others who are in the same boat. Despite all the paranoia about “stranger danger,” children in North America are more likely to be abducted by a divorced or separated parent who disagrees with a child custody ruling. In China, however, many children are abducted by strangers and sold to carry on the family name, work in the family business, and, eventually, support their new “parents” when old age comes. China’s one child policy and its preference for boys makes child trafficking a lucrative business. In fact, the film’s press notes say that human trafficking (of women and children) is a $30 billion business in China. Lost and Love opens with a photo of a beautiful baby, then we see a distraught young woman in a busy intersection – “My child is missing, have you seen her?” she asks, while brandishing photos of her daughter; some do speak with her briefly (“Where did you lose her?” “You should try the Internet,”) while others just hurry by on their way to wherever. Then the scene switches to Lau, as a weary-looking Lei; he’s one of many men standing on the open deck of a moving ferry. His face is dark from the sun and there are grey hairs in his beard and mustache. No fancy clothes here. He still has his famous sharp cheekbones, though. Lei slumps over his motorcycle, awkwardly trying to nap while his fellow passengers examine the large fabric banner attached to the bike, which shows a photo of his son as a baby, along with details of his disappearance. One man tells Lei his quest is useless, and he should give up, another man that there’s no way a father could stop looking for his child. Nearby passengers get caught up in the argument and almost come to blows; Lei just waits for the ferry to dock so he can continue his search. In an accident that is suggested rather than shown, Lei and his motorcycle sustain some damage. 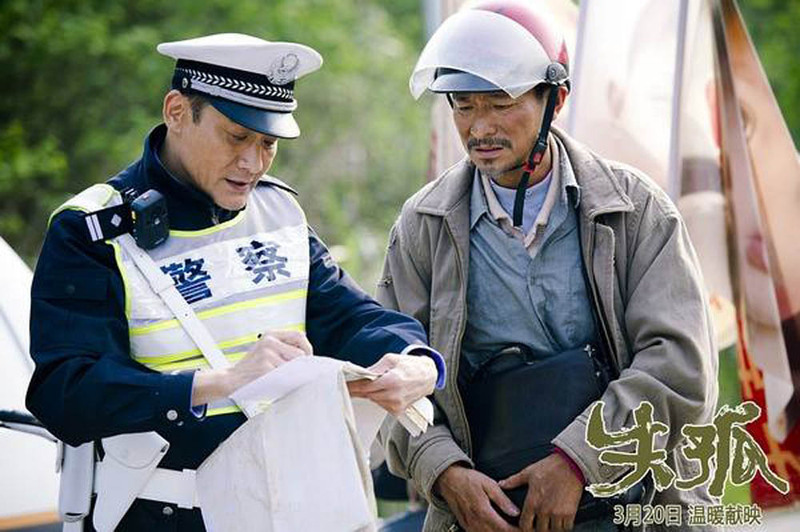 The bike is repaired by young Zeng Shuai (Jing Boran) who reveals that he was abducted himself. Of course, this is very convenient for the plot, but considering how widespread the problem is, it doesn’t seem like such a farfetched development. Zeng yearns to see his parents again and wonders if they are looking for him, too. He’s distressed, because even in his dreams he can’t see his mother’s face; he can only remember her long braid, a bridge and a bamboo grove. He has practical concerns, too, as a stolen child, without an all-important ID card, he couldn’t continue his education, he can’t marry, he can’t even take a train. Lei and Zeng hit the road together. China’s major cities might be drowning in air pollution, but there is still some astounding greenery to be seen in the countryside. While they travel, something like a father-son bond develops between them; it’s charming to watch, but they also bicker a lot, which tried my patience. That’s my only complaint about this film, really. 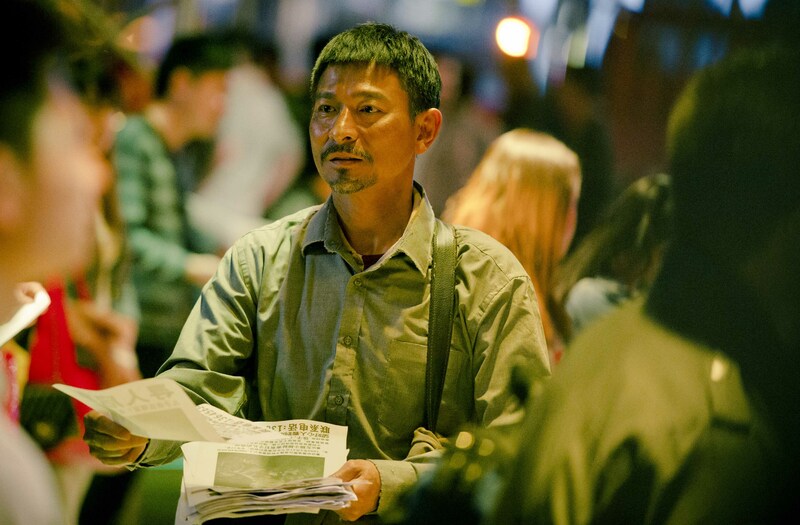 Tony Leung Ka-Fai and Sandra Ng make cameo appearances in Lost and Love as a police officer and a baby trafficker, respectively. Lost and Love is written and directed by Peng Sanyuan. She’s a novelist who has also written TV shows, this is the first time she has directed a film. Lost and Love will be shown in the Canadian cities of Toronto, Calgary, Edmonton and Vancouver. In the U.S. it will be shown in New York State, Washington State, California, Illinois, Maryland, Massachusetts and Michigan. More information about Canadian and U.S. screenings is available here. Information about Lost and Love screenings in Australia and New Zealand here.